Enlisting a company was going to cost me roughly $100,000. I decided that if it was possible to cut the frame myself inside of 2 years, and if it was going to be a job that I would enjoy, then I should seriously consider undertaking the effort myself (full time that is, foregoing outside employment for those 2 years). Although I suspected that it might be possible, I really had no way of judging whether I could build a timberframe house myself in that timeframe, and how much help I would need. 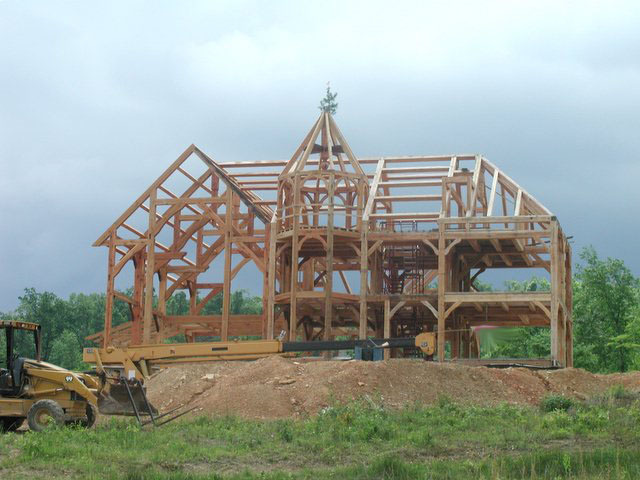 One day, while on Ebay, I put "timberframe" into the search field, and I discovered that the instructor of a timber frame school in Tennessee (6 hours away) had a last minute opening that he wanted to fill. 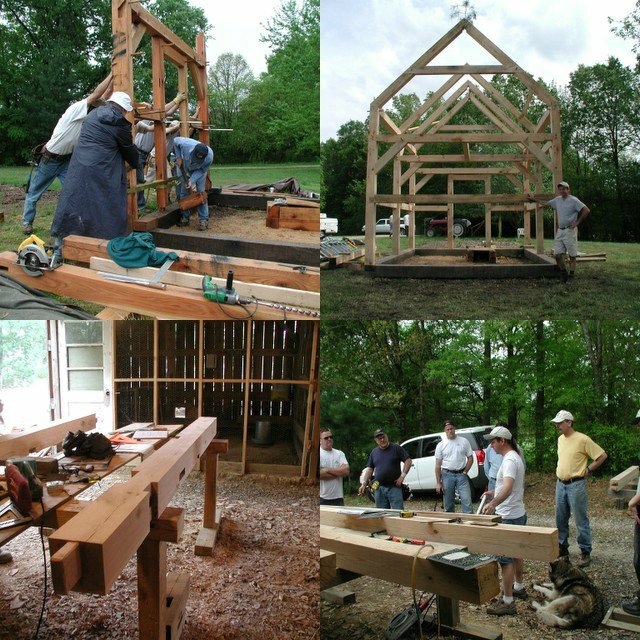 The class would start in a few weeks and the price was a bargain, so I bid on the auction and found myself enrolled in a workshop at the "Grand Oaks Academy of Timber Framing." Gulp. As the first day of the workshop approached, I reflected on the fact that although I was mechanically inclined and had built mechanical and electrical things in the past, I had never really undertaken a carpentry project bigger than a tree-house (and I didn't complete the tree house!). A few months earlier, my brother-in-law and a very talented local carpenter, Chaz, had built an addition to one of our barns (using nails of course!). The gears were turning and I called Chaz to see if he would be interested in taking the workshop with me if I paid his tuition. This carpenter had stick framed 100's of houses, but had never tried timberframing. I called the instructor at Grand Oaks, Scott Stevens, and he made a spot for Chaz in the class. 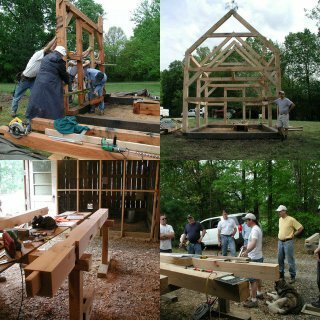 In the course of 5 and 1/2 days, Scott showed 8 of us students how to layout, cut joinery, and hand raise a timberframe for a 12x16 cabin. What an experience. I had gone into the workshop thinking, "if I'm to build a house with timbers, I'll surely use metal fasteners." I left the workshop fully converted to wooden pegs, dovetails, and mortise and tenon joints. Before the end of the week, I did a quick calculation (an extrapolation from the small frame we cut in the class), and figured that it would take about 2,000 hours to notch the frame for my house... assuming I bought one of those nifty little Makita chain mortisers that Scott whipped out on day 3 of the class! Amazon sells this chain mortiser for $80 less than what I paid.